Contact us with your brilliant idea! 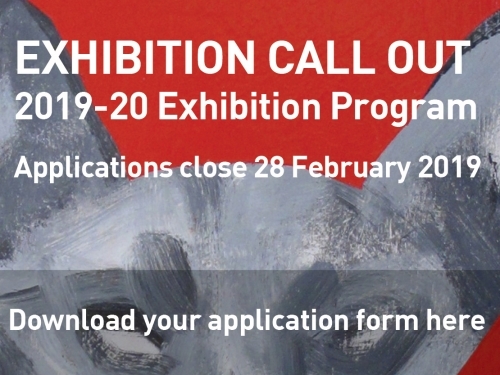 Lone Goat Gallery is now accepting exhibition applications for our July 2019 - July 2020 Program. We're looking for exciting applications from visual artists and creative makers and thinkers. Lone Goat Gallery is a catalytic space, focussed on supporting ambitious exhibitions by Northern Rivers-based artists to realise dynamic and innovative work, and also welcomes applications from artists nationally and internationally. Lone Goat Gallery seeks to exhibit art that is innovative, high calibre, and adventurous. Our aim is to nurture the development of Northern Rivers artists and visual culture, and provide a unique and diverse program of exhibitions for gallery visitors. Lone Goat Gallery also curates and produces special exhibitions and projects in collaboration with partner organisations and artists both in the gallery and offsite. CLOSING DATE FEBRUARY 28 2019.